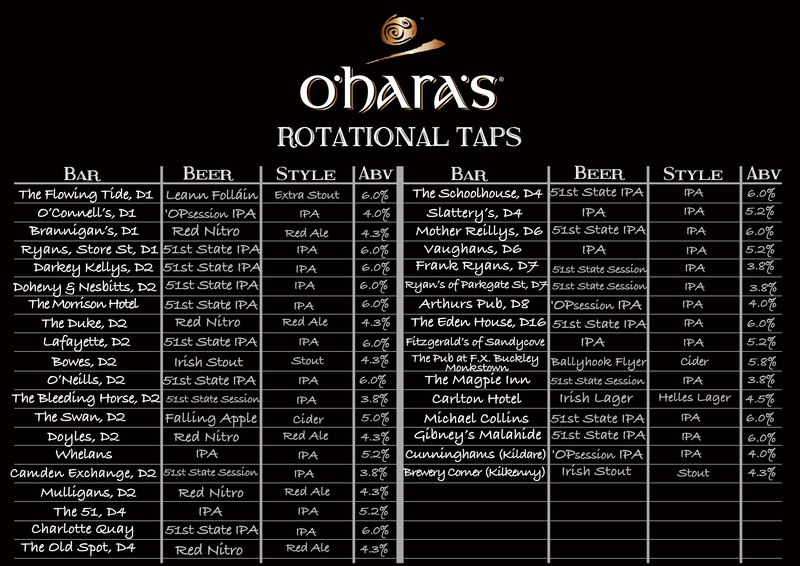 Have you spotted an O’Hara’s Rotational Tap yet? They are quickly becoming a fixture in many pubs across Dublin, Kilkenny, Galway and Kildare and it is not hard to see why. The customer has the opportunity to sample a variety of our beers over a period of time, and can give feedback to the bar on what beer they would like to see next on rotation. From new beers like 51st State IPA and the latest Hop Adventure to old favourites like our Irish Red Nitro (which is available exclusively on draught) and Leann Folláin. It gives bar staff the opportunity to pick and choose different beer styles depending on the season, customer preference or their own taste! We will also add the bar to our digital rotational board and share updates via social media every week tagging them in the post which will hopefully send some new customers their way! If you would like to see an O’Hara’s Rotational Tap in your pub then contact paddy@carlowbrewing.com for more information. Just click on a pint icon below to display the pubs details.